The 98 guestrooms at the Francis Hotel Bath - MGallery by Sofitel are the epitome of indulgent sleep, luxury, and elegance. Newly refurbished, these rooms offer the pinnacle of luxury to each traveler. Rooms feature comfortable beds, Egyptian cotton sheets, and a blissful escape from the busy world. Some of the amenities featured are LCD TVs, complimentary WiFi, plush bathrobes, luxury toiletries, and air-conditioning. Several rooms throughout the hotel feature wonderful, sweeping views of Bath and Queen Square, including the famous obelisk. There are accessible rooms in this family friendly hotel and sleeping cots are available. The Classic One - A cozy haven in which to relax on comfortable beds with luxury linens. 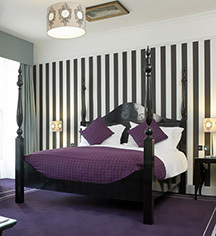 The Superior One - Opulent and stylish, these guestrooms have gorgeous furnishings and two-poster beds. 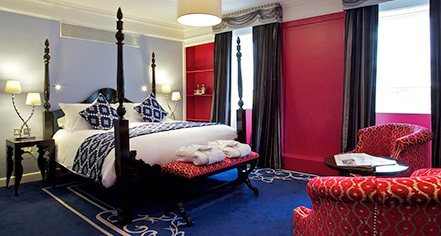 The Feature One - A spacious room with a four-poster bed and beautiful views overlooking Queen Square.